Origin and Habitat: Veltheimia capensis is native to the drier areas of Cape Province and the Karoo to Namaqualand. Habitat and ecology: This species occurs on gravelly flats and rocky slopes in karroid vegetation, fynbos and strandveld, often in the shelter of shrubs. 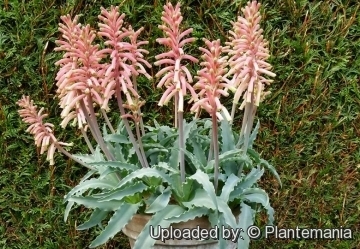 Description: Veltheimia capensis is an erect bulbous perennial, 20-50 cm tall, relative of the familiar spring-blooming hyacinth. It has matte greyish or bluish undulate or crinkly leaves, but unlike the bulbous Haemanthus albiflos seen in many collections, it loses its leaves in summer and has its growing period in winter. It bears a dense raceme of nodding, tubular, flowers 20-35 mm long, varying in colour from white with red spots to pink with green or red markings. Derivation of specific name: Veltheimia was named by Johann Gottlieb Gleditsch (1714-1786) for Count August Ferdinand von Veltheim (1741-1801), a German patron of botany. Bulb: The size of a fist and reddish coloured, partly-exposed on the surface of the soil. The outer bulb tunics are papery. Leaves: In a basal rosette, strap-shaped, thick, up to 30 cm long, and quite large (up to 5 cm across), erect or spreading, tapering, hairless, shiny green, ar greyish green, with a grey waxy bloom, and glaucous beneath. Margin more or less wavy or crisped. The new leaves are produced in winter and retain their colour throughout spring and dry in summer and autumn (but are often evergreen in cultivation). Flowers: In a dense raceme at the end of a sturdy, erect stalk which is green in colour, mixed with shades of purple and spotted. The flowers are drooping, cylindrical 25-35 mm long, in various shades of mottled pink, tipped green. The stamens are exserted a short way from mouth of tube. The plant generally flowers in late fall into winter or early spring. Fruit (capsule): Large, membranous with three wings. 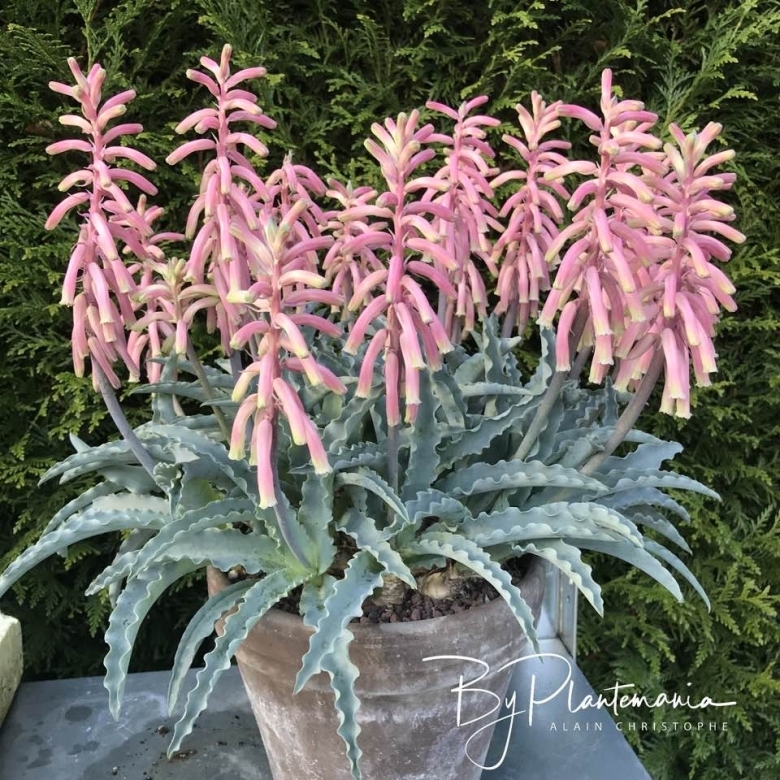 Similar species: Veltheimia capensis is similar to Veltheimia bracteata (mainly Eastern Cape) but the latter is evergreen and prefers shady conditions. Moreover its bulb is completely below ground. 2) Mabberley, D.J. “Mabberley’s Plant-Book”. Cambridge. 2008. 3) Pooley, Elsa. “Wild Flowers KwaZulu-Natal and the Eastern Region”. Natal Flora Publications Trust 1998. 4) Wikipedia contributors. "Veltheimia capensis." Wikipedia, The Free Encyclopedia. Wikipedia, The Free Encyclopedia, 18 Sep. 2015. Web. 23 Jan. 2017. 5) Stearn, William T. “Stearn’s Dictionary of Plant Names for Gardeners”. Cassell. 1993. 8) Bob Mitchell St Andrews Botanic Garden, “Plant of the month: February 2016 Veltheimia bracteata”. 12) “A-Z Encyclopedia of Garden Plants”. New York, New York: DK publishing inc. 1997. 13) “RHS A-Z encyclopedia of garden plants”. United Kingdom: Dorling Kindersley. 2008. Cultivation and Propagation: Veltheimia capensis delights in rather damp growing conditions and is suitable for growing in the shade under trees and shrubs and under glass. It has its growing period in winter. During the summer it should be kept quite dry and given a good baking. In November it gives signs of growth and watering should start. Some water must be given all the winter. Veltheimias make good house plants and will flower in the winter months. Bulbs should be planted with at least one-third above ground. 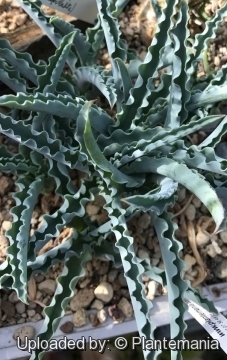 Water requirements: Veltheimia capensis which is from the Mediterranean climate zone. It need some water during the winter and dry conditions when dormant in summer. 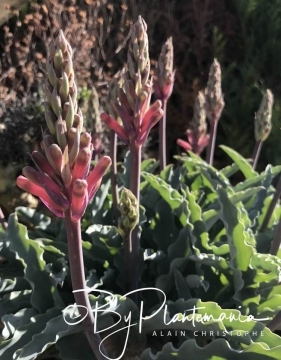 The related Veltheimia bracteata grows in moister areas of Cape Province and should be watered all year round.